A light cinnamon-flavored toasted tortilla with a matching cinnamon dip. This is a nice light dessert that is perfect at the end of any meal with a Mexican flair. It also makes a great anytime treat. Melt butter and brush on the front and back of each tortilla. Combine the sugar and cinnamon; stir to mix thoroughly. Sprinkle the sugar and cinnamon on top of all the tortillas. Cut each tortilla into 8 wedges to create the chips. Place the chips on a baking sheet. Bake for 8 to 10 minutes or until crisp. While the wedges are baking, combine the dip ingredients together and beat until smooth. Serve chips and dip together. 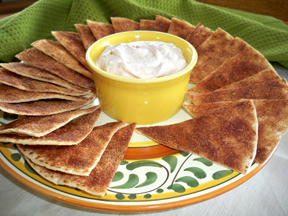 "LIKE TO TRY THIS--MEXICAN CINNAMON CHIPS AND DIP--BUT I CAN'T SEEM TO FIND THE OVEN TEMPERATURE. 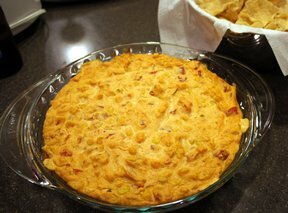 THANKS"
"I tried making just a half a recipe of these chips and dips to see if I would like them before taking them to our Cinco De Mayo party. They were good, especially the dip. I will definitely make them for our party"